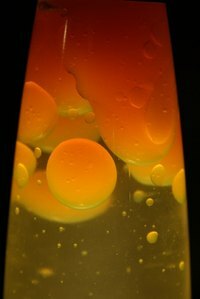 The lava lamp was invented by Edward Craven Walker in the mid-1950s and consisted of a top secret combination of oil and wax and a few other undisclosed ingredients. Because it is less dense than water, wax expands and floats when heated to a certain temperature. As the wax rises in the lamp's liquid center, it moves away from the source of heat at the base of the lamp and cools, causing it to sink back down toward the base of the lamp where it is reheated again. Remove the label from an empty bottle of whiskey with hot, soapy water. Clean the inside of the bottle to remove any trace of the alcohol. Set the bottle aside. Cut a notch out of the edge of one side of the cut PVC pipe wide enough to fit the cord of a utility lamp. Position the PVC pipe so that it sits on the table with the notched edge facing downward. Thread a utility light through the pipe so that the corded end with the plug hangs out through the notch at the bottom of the pipe and the socket end sits on the the table, socket facing upward. Insert the bulb. Place the bottle right-side up in the PVC pipe over the bulb. Break several white candles into a tin can. Remove the wick. Fill a saucepan with 3 inches of water and place the tin can inside the saucepan so the water surrounds it. Place the saucepan on a burner over medium-low heat. Stir the wax as it melts with a wooden spoon. Pour the melted wax into a glass measuring cup until it measures 2/3 cup. If you have extra melted wax, set it aside for later use. Pour the dry-cleaning fluid into the measuring cup until the liquid in the cup measures 1 cup all together. That is, you are only adding 1/3 cup of Perc to create 1 cup of lava. Quickly, before it settles, stir the mixture with a wooden spoon continuously for at least 5 minutes. Disassemble the wire coat hanger and coil a 1/2-inch-long spring (about 1/4 inch in diameter) from the end of the wire using the needle-nose pliers. Snip the end of the wire off just below the spring with wire cutters. Use a pair of long-handled tweezers to position the spring face up (so the coil spirals upward) at the bottom of the whiskey bottle. Warm the bottle under hot water for about 5 minutes. While the lava is still molten, pour it into the empty bottle. If the lava is not molten, place the measuring cup into the saucepan after removing the tin can and slowly heat the mixture until it liquefies. After pouring the lava into the bottle, let it cool until it solidifies. Fill the bottle up to the base of its neck with water. Add a few drops of food coloring to give the water a tint. Add two teaspoons of pickling salt to the water mixture to increase the density and boiling point of the water. Screw the cap on the bottle and switch the utility light on at the base. Let the lamp remain on for at least 3 hours for the wax to melt. If the lava fails to rise, add a pinch more pickling salt. If the lava rises and refuses to sink, let the lamp cool completely, pour out the water, refill it and use a little less salt. Secure the socket in the pipe by running rubber-coated wire from the edges of the pipe around the fitting of the socket so that the bulb doesn't wobble inside it. If the lava doesn't mix with other blobs of lava when they float to the top of the bottle, add just a pinhead-sized droplet of dishwashing liquid to the water. When perchloroethylene is added to the wax, it expands. Be sure to wear your safety gear when making the ooze. Consult a scientist or doctor to be sure that you are fit to work with these materials prior to attempting this project.